Effective marketers should be able to tie every single lead, customer and dollar back to the marketing initiative that created them. That is the power of closed-loop marketing. Closed-loop marketing cuts through the widespread vagueness of marketing myths and assumptions and reveals real dataabout the success (or failure) of your marketing efforts. This free 38-page guide is the ultimate resource for understanding the link between marketing and sales. 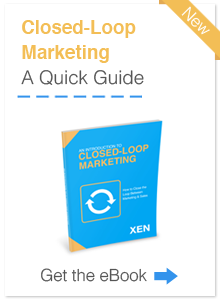 Download our "Introduction to Closed-Loop Marketing" guide to take the blindfolds off and focus on actual results rather than fuzzy metrics. Grab your free copy over to the right, and start optimizing your marketing and sales efforts!